Refashion Co-op: Miss Marple, the muse, and a refashion. Miss Marple, the muse, and a refashion. 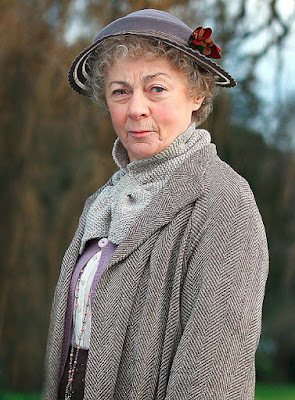 I enjoy the films and series featuring Agatha Christie's Miss Marple. 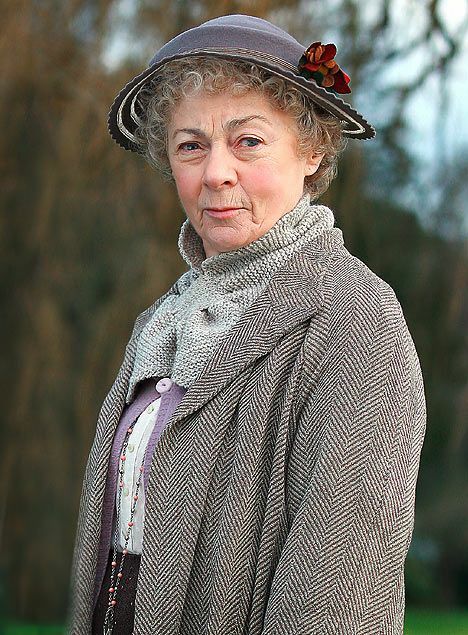 My favourite of them all is played by Geraldine McEwan and I love her wardrobe in the shows. With this inspiration in mind I decided that this oversized waterfall cardigan would be perfect to refashion into a coatigan, similar to those Miss Marple wears. For details on how to cut out the shape have a look at my post here. And then, I changed my mind, mainly because I didn't suit it, I think it was too much grey on me. So I chopped of the bottom, moved up the pockets and changed the buttons!! A granny look cardi, that's now a new favourite. Genius. I seriously want to find one of those sweaters now and try this! I also love that look :) Thanks! Such a great project. What a difference those larger buttons make! Really great refashion. I love the color and the texture of the fabric too. Looks great! Love the Miss Marble inspiration! Thank you all very much. I'm wearing it right now. If I find another giant cardi I'll make another one too, it's a comfortable shape to wear.